For over 60 years, PCDS has deftly balanced tradition with innovation. Through cutting-edge facilities and expert faculty, we support our students' growth to be able to face life's most pressing challenges, creating tomorrow's intellectual leaders today. 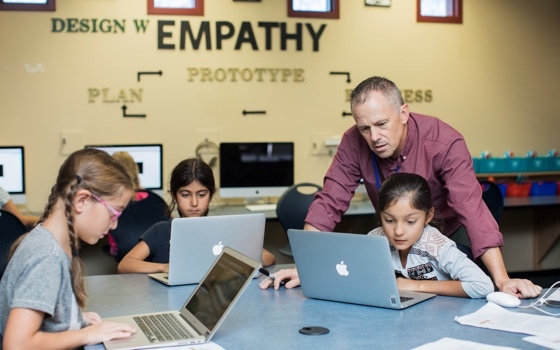 Mr. McKean’s main objective across all grade levels is pretty simple – to create problem solvers. He guides his students to depend less on asking for a solution and more on finding a solution by digging into their own minds to solve problems. Mr. McKean utilizes 3D printing in his classes, although the end result becomes less important then the process. While his classes do focus on what the end product might be, what it is going to be used for, and what problem will be solved, even more importantly, the students are asked to focus on details, and making sure the object is designed with as much precision as possible. Using a “measure twice, cut once” approach is key, as making unlimited prints to fix design flaws is not an option. Ever-evolving, Mr. McKean’s technology program will never be set in stone, as technology and the world changes too often to get comfortable. As he says, he is never finished, but rather just waiting for the next improvement. 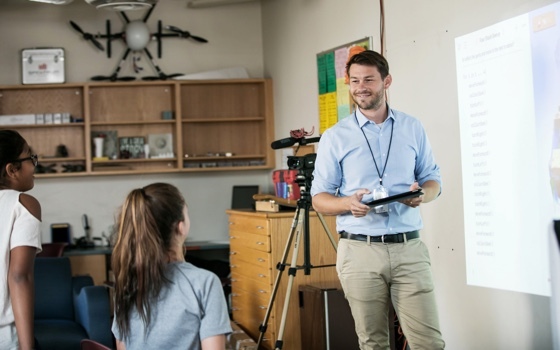 Using a personalized, individual, and goal-oriented instructional technique, one of the ways Mr. Girod encourages curiosity and follow-through is by leaving assignments open for submission in multiple formats. Class lessons are intended to be a challenge to students. There are no right answers, only goals for students to reach. Mr. Girod models his approach based on current technology today. Design, in Mr. Girod’s opinion, is a way of thinking – it is the idea of stepping back, understanding a problem, and coming up with a great way to solve it. Most people do not find the best answer the first time, and that is why they keep designing. The more designing, the better the designer. Mr. Girod’s classes emphasize team-building activities that focus on organization, work ethic, creativity, problem-solving, and collaboration. Students create their own goals and can focus on coding, or programming, or digital media. As students advance, they might choose to code an app, program a game, or make a digital movie, magazine, or animated piece. Mr. Girod emphasizes digital citizenship, and the goal is to help students understand that their choices online impact people offline. Build a hypothesis. Make a plan. Execute. Refine the process all again with new data. There’s rhythm to the grind of scientific research, and it’s in this experience where Madison Stringer is most enthralled. She relishes the details and minutiae, embracing the challenges of the iterative process and the joy of discovery. 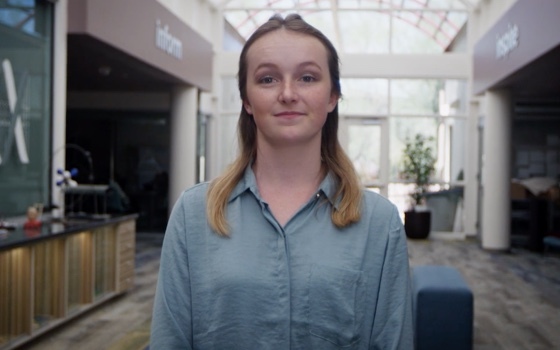 During her four years at PCDS, Madison has taken nearly every lab science course at PCDS, from doubling-up on both Advanced Chemistry and Physics as a sophomore, to Advanced Chemistry II, Biotechnology & Bioethics, and an Independent Study in research as a junior, and finishing with a remarkable three science courses as a senior, including Organic Chemistry, Biology II, and another Independent Study of her own design.